If you want a solid PS3 game library, start with the games below. Naughty Dog’s violent, heartfelt, emotionally exhausting epic The Last of Us is the studio’s crowning achievement, and easily one of the most impressive games on the PlayStation 3. Its story of survival in a post-apocalyptic world may be built on a foundation of zombie-movie clichés, but the tale of the embittered smuggler Joel and his relationship with a young girl named Ellie is so full of heart and wrought with such subtlety that any concerns about overfamiliarity quickly fade away. Better still, in addition to its beautiful art, gorgeous soundtrack and eye-popping cutscenes, the game itself is quite well-made. It’s an often terrifying, exhilarating mixture of stealth, action and horror that plays out over sprawling levels and is unafraid to make the player feel disoriented and disempowered. A Good Match For: People who like their games intense—The Last of Us is relentless, and the intensity of its narrative is matched by its discombobulating, often panic-inducing combat. This game is also great for those who like cinematic, movie-like games, and it’s a good game to show off to your friends, roommates, or significant others. It’s the rare game that looks so good (and is written so well) that it’s fun to watch as well as play. Not a Good Match For: Anyone looking for something fun or lighthearted. The Last of Us is a ceaselessly grim, often emotionally wrenching experience. Very bad things happen to good people, and it never gets easier to watch. Its closest literary analogue is Cormac McCarthy’s The Road, and in terms of grimness, The Last of Us matches and sometimes exceeds McCarthy’s often horrifying novel. The often difficult combat is exceptionally violent, so this game is not for the squeamish. A Good Match For: Pirate fans; history buffs; anyone who’s ever wanted to pull up alongside a British frigate, grab a rope and swing from one deck to the other before fighting your way up the deck to take on the captain. So basically, anyone who’s ever wanted to be a pirate. How do you top the beautiful, poetic experience that was ThatGameCompany’s Flower? Easy, just make a game that strips away everything annoying of maddening modern online gameplay and set it inside a lush gameworld that looks like a living painting. The travels that you undertake in Journey culminate in an incredibly touching moment. It’s not just one of the best PS3 games. It’s one of the best games ever, period. A Good Match for: Shy people. Just like Flower before it, Journey is a wordless experience. The limited set of gestures you use to communicate means you won’t have to worry about embarrassing yourself by saying something awkward. Not a Good Match For: People looking for conversation. If you spent a big chunk of time sand-surfing with another person, you’ll probably want to learn a bit more about him or her. Journey never lets you do that, though, and that enforced silence makes up much of its impact. Does a great game have to be fun? Does it have to make you happy? The beautifully sad Papo & Yo is one of the most personal games you’ll ever play. On the surface it’s about a boy and a monster who can be helpful but who can also fly into harmful rages. It’s all a metaphor for the lead game creator’s own experiences with his alcoholic father. This brief third-person game will put your brain to the test from time to time, but it’s mostly a game that will touch your heart. A Good Match For: People looking for something personal and moving and for those who will enjoy the distinct visuals of a game with a South American look. Not a Good Match For: Gamers looking for something they can play for dozens of hours. Papo & Yo will linger in your mind, but there’s not a lot to play and not much reason to play it again. Sure, yes, Dark Souls is hard. For better or for worse, its difficulty is its defining characteristic. But Dark Souls is also so much more than hard—it’s an expertly crafted, fiendishly smart game that refuses to hold the player’s hand and as a result, forces a level of engagement almost unheard of in modern games. There’s a reason that so many modern games are described as “It’s like Dark Souls, with…” One of the most influential and flat-out great games of the last several years, Dark Souls is like no other game ever made. A Good Match For: People who want their games to ask a lot of them, and expect a lot in return. Dark Souls is one of the most rewarding games ever made, provided you’re willing to put in the time and really, really pay attention. Not a Good Match For: The easily frustrated. If you like your games to be fun, breezy ways to blow off steam after work, Dark Souls probably isn’t the game for you. You’ll die, you’ll lose progress, and the only way you’ll continue forward will be by the skin of your own teeth. Which is the designers’ intent, but it’s not for everyone. Part stealth-action game and part crazy sci-fi film, Metal Gear Solid 4 is the type of nutty experience that can’t be neatly categorized into a genre. The premise: you’re Solid Snake, a super-spy-soldier who can either shoot or sneak his way through missions en route to saving the world before he’s killed by the cells in his body, which are aging at an accelerated rate. (Don’t ask.) Check out the Metal Gear Solid Legacy Collection, which gets you MGS4, the HD versions of MGS2 and MGS3, the original MGS, and a few others. A Good Match For: Anyone who likes stealth games, shooters, and crazy stories involving guns and nanomachines. The latest in Q-Games’ wonderfully stylish offerings pays homage to memorize-the-sequence shoot-em-ups of the 80s and 90s, and add modern twists that provide even more challenge. Check out PixelJunk Eden, PixelJunk Shooter and PixelJunk Monsters for more Q-takes on tried-and-true genres. They’re all brilliant. Really. A Good Match for: Galaga fans. Defender fans. Sinistar fans. If you ever stuck a quarter into an arcade stand-up machine to fly a spaceship, this game will bring back old joys and introduce you to new ones like co-operative blasting. Not a Good Match For: Retro-haters. The games feel like modern-day versions of old-school games. You’re not getting a complicated 3D adventure here. Arguably the best outing in Insomniac’s buddy adventure franchise, A Crack in Time still offers the prankish cool of the dev studio’s witty weapons but also throws in mind-bending time-manipulation platforming to blaze all paths in an all-new way. A Good Match for: Star Trek fans. Sure, the Lombax-and-robot duo violate the Prime Directive all over the place but A Crack in Time’s action should satisfy anyone who liked watching Kirk get into a scuffle as well as pleasing those who prefer Spock’s cool Vulcan logic. This one is also probably the best game on our list for kids. Not a Good Match For: Fans of busywork. Some of the interstitial space stuff—battles with enemy fleets, blasting asteroids into smithereens—just feels like filler, no matter how good it looks. When you ask game developer Level-5 (Dragon Quest VIII) and animation house Studio Ghibli (My Neighbor Totoro) to make a game together, good things happen. Ni no Kuni, the product of that partnership, is charming, satisfying, and one of the prettiest games on the planet. It’s an old-school JRPG with a very modern coat of paint, and although the combat can occasionally be a bit too challenging for inexperienced players, it’s a blast to watch and play. A Good Match For: JRPG fans, Ghibli fans, cartoon fans, fans of fun and charm and things that are good. Not a Good Match For: Anyone who doesn’t have the patience for semi-turn-based combat and JRPGish questing. Inexperienced gamers who might find the combat too difficult. Update 4-27-17: What’s this? An... update? Indeed it is! Years after our last PS3 update, we’ve made one last change: Valkyria Chronicles has left in order to make room for Persona 5. Good job, Persona 5. You were the last one through the door. Update 12-10-13: Our new Bests design brings with it a bunch of new PS3 entries, as we take the opportunity to clear out some old games and add in some others. Gone are Call of Duty: Modern Warfare, Demon’s Souls, NBA 2K12, Assassin’s Creed II, Heavy Rain, LittleBigPlanet 2and Shadow of the Colossus HD. Taking their place are Valkyria Chronicles, Dark Souls, Metal Gear Solid 4, Papo & Yo, Assassin’s Creed IV, Grand Theft Auto V and Ni No Kuni. Update 06/17/13: One Naughty Dog game leaves and another enters. It’s only been out a few days but there’s a nearly unanimous sentiment The Last of Us is one of the most well-executed games of the PS3's life cycle. There’s only room for a dozen games on a Bests list and this time TLOU elbows out its Naughty Dog labelmate Uncharted 2. Different games with different goals, yes, but The Last of Us is just more accomplished overall. Update 11/14/12: The update here is that there is no update. Kotaku’s editorial team talked back and forth about very good recent releases—Papo & Yo, Need for Speed: Most Wanted and The Unfinished Swan, along with others—but ultimately decided that none of these titles would unseat the current PS3 Bests list. 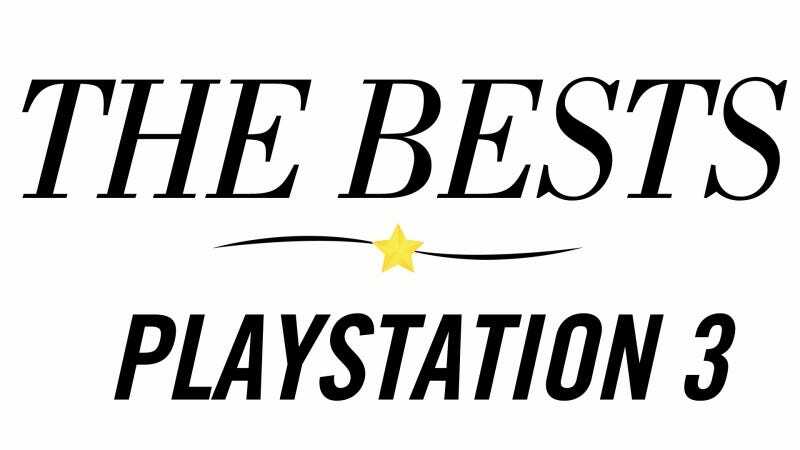 We’re still going to factor in games like Call of Duty: Black Ops II and PlayStation All-Stars Battle Royale for Sony’ s home console but need more time to see if these game really belong on a list of The Bests.